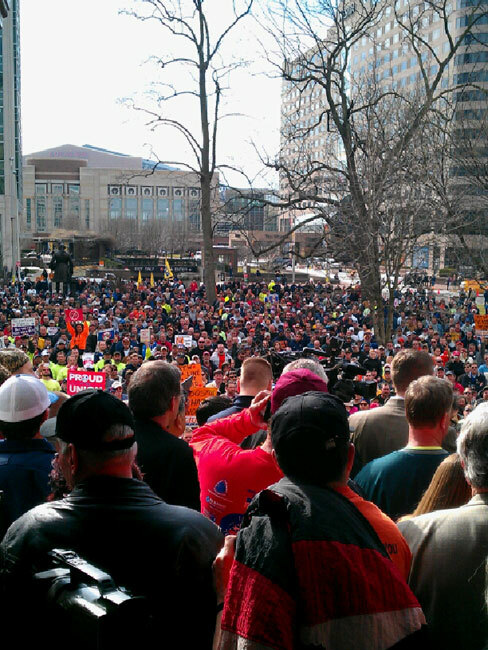 THOUSANDS OF UNION members, including Boilermakers, rally outside the Indiana statehouse in Indianapolis against right to work as the state Senate votes 28-22 to pass the legislation today. Gov. Mitch Daniels is expected to sign the bill into law, making Indiana the 23rd state in the nation with “right to work for less” on the books. The law will apply to any written or oral contract or agreement entered into, modified, renewed, or extended after March 14, 2012. It does not apply to or abrogate a written or oral contact or agreement in effect on March 14, 2012.